The hurting wonder: “Don’t they know what has happened to me?” But God is there, beside us, beneath us, around us, within us. That is what Christmas is about. Christmas, Lights, frivolity, candy, parties, presents. ‘Tis the season to be jolly. But for many this season there is, as Thomas Hardy put it after hearing that darkling thrush, “so little cause for carolings.” Holes have been brutally cut out of our picture of what Christmas is all about. For the first time ever, your father isn’t around to haul in the tree. No pumpkin pie from your mom. The children are to be ferried between warring mom and dad. Somebody calls to set the date for your first dose of chemotherapy. The bed into which you have always crawled with your husband on Christmas Eve after arranging the presents is agonizingly empty. Children dash by your window, laughing and you are crushed by the absence of the child you never imagined living without. Everybody’s having such a grand time — but the ache….Don’t they know what’s happened to me? As a minister, I guess it’s my job to know what’s happened. I bury the dead, I hear about terrible things, I pray and try to shoulder pain. Recently someone was sympathizing with me I guess, asking how I manage not get burned out, with so much heartbreak laid upon my desk. I was tempted to answer by saying, “Oh, it’s not so bad,” or, “Usually the good outweighs the bad.” But that was wrong. If I ever burn out, it will be because people gripe and can be so petty. The funeral for a young man, praying with a woman whose husband has deserted her, just hanging on to someone who can’t stop crying — it is a privilege to be there. It’s why we do what we do. When someone dies, when someone devastated by grief struggles to move forward, we glimpse something noble about humanity that we sadly fail to see most of the time while we’re going about our business. 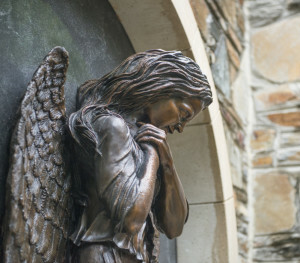 Grief at Christmas is unspeakable – but we dare not deny it. For the whole point of Christmas has to do with the ache. We get duped into thinking that God and suffering are polar opposites. If you are suffering, get away from there and run toward God. Or, where God is, there is sweetness and light and the absence of pain. But the story from the real manger was that God embraced our lives at the point of our pain, rejection and poverty. All of our souls are pierced. We all suffer inevitable losses. But God is there, beside us, beneath us, around us, within us. That is what Christmas is about. Martin Luther told us that God became small for us in Christ: he showed us his heart, so our hearts could be won. And, I would add, comforted. God enters our pain, so that we never suffer alone. Somebody does know what’s happening to me! But God also whispers to us that there is a future, God’s future, that we can ultimately trust, and hang on to. That’s why God came as a child – for Wordsworth was right: “A child, more than all other gifts that earth can offer to declining man, brings hope with it, and forward looking thought.” From the inside of our lives, the Christ child points beyond whatever we see in this single moment.